Pilmico, the food subsidiary of Aboitiz brings you the Mahalin Pagkaing Atin program, that aims to raise awareness about loving the Filipino food. The task is to travel around the country through Food and Livelihood Expos, visits poverty and conflict stricken areas to build a new life and teach them a sustainable livelihood. They started last year 2014 and during every Food and Livelihood Expos, Pilmico conducts seminars on animal husbandry, nutrition, baking and cooking demonstrations to showcase the different flavors of the provinces and promote local delicacies. Speaking of which, a sample of Food and Livelihood Expos happen in Manila for its launch , specifically at Mercato Centrale in Bonifacio Global City recently. A cooking demonstration by Chef Boy Logro was witnessed and we all tasted the food specially of Northern Luzon like bagnet and longganisa made more special by Chef. 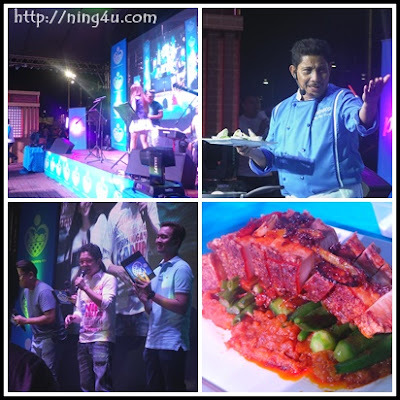 Aside from food, we also enjoyed fun games, wisdom and get to know more about Pinoy food from the Master Chef himself. What a night to spend with bloggers, food enthusiast and Pilmico executives. Mahalin Pagkaing Atin focuses on helping, teaching, and encouraging farmers to embrace backyard farming as a sustainable form of livelihood for locals as Pilmico distributes piglets and egg machines to selected beneficiaries with full cycle feed consumption. This does not only promote sustainable entrepreneurship and homegrown produce, but also instills a “pride of product, pride of place” mindset for both the farmers and consumers. This is “embrace local” and “love local” in action. For more information about "Mahalin Pagkaing Atin" follow them on Facebook and Instagram.